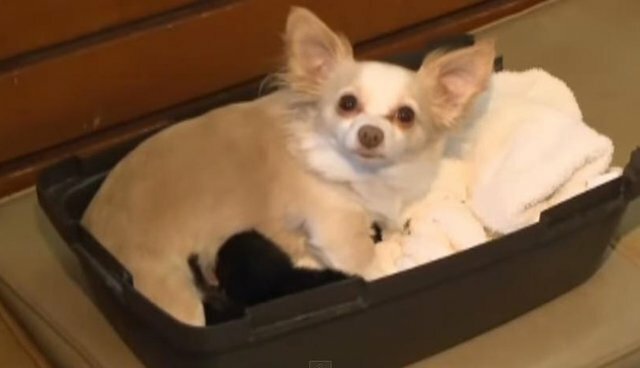 When Jaime Apfel took in two tiny foster kittens, she never expected that her Chihuahua Lucy Liu would adopt them, but the little dog proved that motherly love sees no boundaries. Apfel, a veterinary technician, volunteered to foster kittens through the Hi Tor Animal Care Center in Pomona, New York, News12 Westchester reports. She was prepared to do whatever it took to care for little Boo and Sully, but to her surprise, Lucy Liu stepped in to play mom to the newborns and began to nurse them herself. "It didn't matter to Lucy that these babies were not puppies, they were helpless and they needed her," the shelter posted on Facebook. "The urge to nurse and love them was greater than anything else." Boo and Sully will be up for adoption at the Hi Tor Animal Care Center as soon as they get a little bigger ... and as soon as their furry foster mom is ready to send them off into the world. With kitten season already begun, newborns like these are in desperate need of loving foster homes. An estimated 20 million kittens will be born this spring, many of them to strays and homeless cats, so shelters need all the help they can get. Even if you don't have a motherly Chihuahua to help out, consider caring for kittens in need. Contact your local Humane Society to find out how you can volunteer.